Near the center of the town of Neuruppin, not far from Berlin, sits a large if unassuming house that once belonged to the local newspaper publisher. After the Second World War, it became the local Stasi headquarters. They adorned the brick façade and red tile roof with a myriad of surveillance equipment, antennas and satellite dishes. The better to hear you with. Even today, some locals make a wide circle to avoid passing directly in front of it. The Stasi, short for Ministerium für Staatssicherheit (Ministry for State Security) was the East German’s secret police, charged with protecting the state from enemies both foreign and domestic, real or imagined. Lesser known than their Soviet counterparts in the KGB, they were no less feared. It is not a coincidence that Stasi rhymes with Nazi. Erich Meilke, the man who led the Stasi for over 30 years, in 1958. He worked for DDR leader Walter Ulbricht for much of his tenure. The Stasi began operating in 1950. Its international exploits during the Cold War included training Castro’s secret police, running brothels in West Germany for the purpose of blackmailing West German politicians and businessmen, and funding Neo-Nazi groups in West Germany in order to discredit democracy. In the early 1970s, they even succeeded in having an agent appointed as an aide to the then West German Chancellor Willie Brandt. But it was their work as an internal secret police that kept East Germans looking over their shoulders. Their network was extensive. Most apartment buildings, neighborhoods, factories and government agencies had at least one informant, spying on their neighbors and informing on them regarding the slightest infractions, which were then documented to the minutest detail. By the time the Berlin Wall fell in 1989, the Stasi employed some 91,000 agents and operatives, and had another 173,000 informal informers from whom they gathered information. As a point of comparison, Canada today has about 2,500 security agents for twice the population. The Stasi compiled extensive files on much of the East German population. Olympian Katerina Witt had information collected on her going back to the age of six or seven, when she first began to show promise as a figure skater. The DDR was terrified she might defect to the West and that they would lose one of their crown jewels, so the Stasi kept track of almost everything she did and said. Friends, relatives and team-mates were either convinced or coerced into keeping tabs on her. Her home contained hidden microphones to record her conversations. Surveillance wasn’t just done on the famous or important. Everyday people were spied on with regularity. Seemingly mundane transgressions were often considered crimes against the state. One woman had a file started on her because she bought a sweater from the West. She laughs about it now, but such activities, could have dire consequences. A neighbor and informant went through one man’s cupboards to find that he had some pudding from West Germany. Shortly after, he lost his job and was unable to find another. He and his family ended up destitute. As the Cold War came to a close, the Stasi tried to destroy these files. But when people saw smoke rising up above the Stasi Headquarters in Berlin, they stormed the buildings and put an end to the destruction. While about 5 percent of the files were destroyed, most of them remained intact. Today, they take up over 100,000 kilometers of shelf space in the Stasi Museum, located in that former Berlin Headquarters. 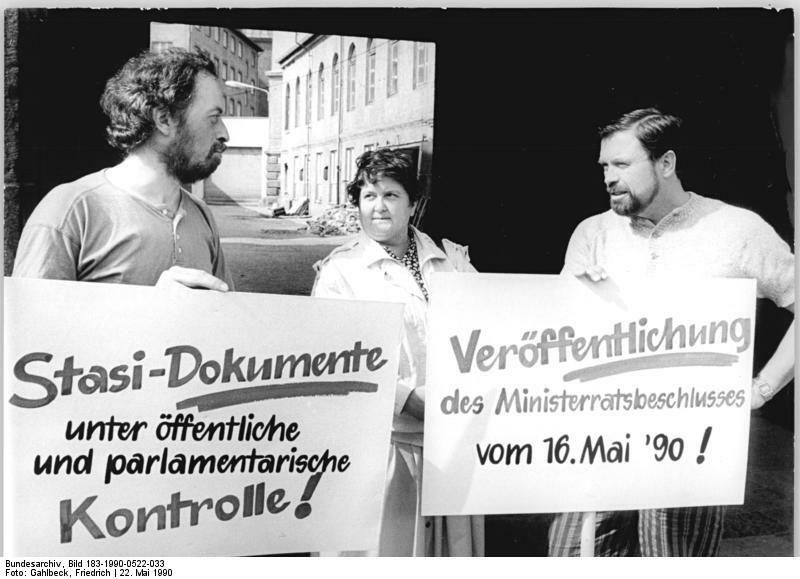 Under German law, former citizens of the DDR can request to see their files. Some 2.75 million people have done so since the law was passed in 1991. The Stasi did more than just watch and listen and record. As with the man who was guilty of nothing more than having a taste for West German pudding, they acted against those they felt were a threat to the state. They had learned early on that the traditional methods of most secret police, torture and imprisonment, had a limited effect. The victims often became martyrs or heroes and it did little to discourage others. Nelson Mandela is but one prominent example of this. Instead, they employed much subtler methods, known as Zersetung (corrosion or undermining). They conducted smear campaigns to discredit people along with threats and intimidation to get what they wanted. Wiretapping and bugging were commonplace. Sometimes, they would move a person’s furniture or take a picture down from their walls - all to send the message that they were always there, always watching. Their victims were forever on edge, waiting for the next shoe to drop. Some even went insane. Zersetung had the added advantage of deniability. With no one in prison, no one physically hurt, the Stasi could deny any involvement. This worked so well that by the year 2000, only 33 Stasi officers had been sentenced by German courts for their crimes, and of these, 28 were suspended. When revelations about NSA surveillance surfaced earlier this year in the US, most Americans did not seem overly concerned. Germans, however, have been much more vocal in protesting what they see as an invasion of their privacy. There have been public protests, and it came up as an issue in the general election there. Learning how the East German people were intimidated into obedience by an ever watchful and secretive organization like the Stasi, it is easy to understand their reaction to what many see as an unfettered invasion of privacy. After all, the NSA data center is estimated to be able to save 5 billion terabytes of data - 1 billion times more than the Stasi kept in their notorious paper files. That’s a lot of sweaters being bought from the West. Enjoy this article? Well, another East Germany related article from Manfred is here. It is about the story of how a Trabant car defined a nation.